Frederick Harvesting runs twenty three (23) Kenworth trucks that transport grain, equipment, and our crew during the harvest. The smaller tandem trucks can haul up to 600 bushels at a time, while the bigger semi-trucks can haul around 1,000 bushels of grain. Late model Wilson grain trailers are paired with each of the semi's. Our service trucks consist of 4 Kenworth semis. The Kenworths are capable of hauling 700 gallons of fuel, 200 gallons of oil, and 50 gallons of water. They are equipped with industrial hydraulic air compressors, 300 amp welders as well as torches, tools, and extra supplies needed in the field. 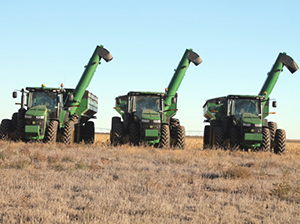 We operate ten (10) John Deere S670 combines to bring in your crops, all equipped with straw choppers, contour master lateral tilt, and 40' draper platforms with automatic header height sensing. Additionally, four are equipped with four wheel drive. 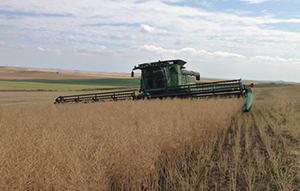 On an average, heat-filled summer day, Frederick Harvesting can cut approximately 1,500 acres and haul over 50,000 bushels of wheat. Our combines are equipped with John Deere's GreenStar 3 precision farming system, giving them yield map and auto steer capabilities. We operate nine corn heads and seven Flex drapers to fulfill your fall harvest needs. 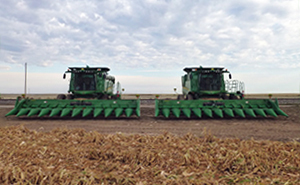 One of these machines can harvest an average of 130 acres and 30,000 bushels of corn per day! 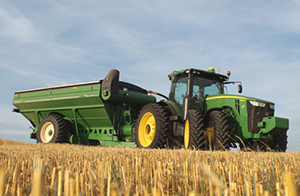 Our company operates John Deere 8R series tractors and eight (8) 1196 Brent Avalanche grain carts, all of them being equipped with electronic scales. The grain carts are capable of unloading 1,000 bushels of grain in about 90 seconds. Having a grain cart in the field and having an efficient operator keeps combine downtime to a minimum. An efficient grain cart driver is one of the keys to having an efficeint operation in the field.